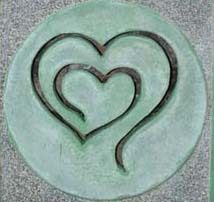 Years ago, while trying to decide what to name my web site for my work as a relationship specialist, author and labyrinth facilitator, I had a dream that the name of my work should be “Heart Path.” This seemed to perfectly encompass my work with others on the journey of love and life, so I quickly purchased the URL HeartPath.com. I then tried to create a logo that would be fitting, but every time I drew a spiraling heart-shaped labyrinth it came out with too many circuits and was too complex for a logo. A friend mentioned that from the side the design looked like an Om, meaning God in Sanskrit. Surprised by this discovery, I literally turned this project toward God, turned my paper a quarter turn to the right and drew as if I was drawing an Om. Lo and behold when I turned it back to its upright position, it was exactly the heart path design I was seeking. The labyrinth represents the spiritual journey of life and in this case, a journey from one’s head (ego/thought) to their heart (spirit/intuition/feeling). In my experience, when we are in our heads, we are cut off from our hearts, but when we can access our hearts, we are simultaneously able to use our heads. This heart path journey is one of deep self-discovery, heart-opening, soul-awakening and thought-provoking. Just on a whim I wondered if the logo design meant anything turned any other way, so I turned it a quarter turn to the left only to discover that it spelled E.V.E. (the “V” is lying on its side).—which just happens to be my name)! Clearly, divine workings were at play here! 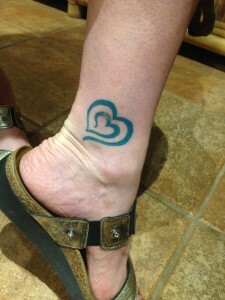 One woman liked our logo so much she had it tattood on her leg!